With spring fever all around us, the Sofitel Ambassador Seoul's buffet restaurant King's is offering a special spring herb menu featuring various fresh herb dishes full of vitamins and organic ingredients. 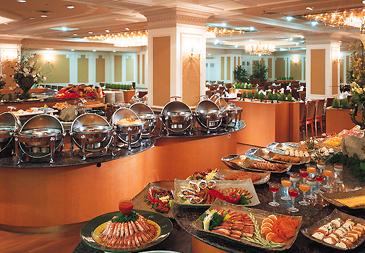 On top of its regular dishes, the buffet restaurant is featuring a special selection of herb dishes including artichoke, asparagus and a variety of herb salads, fresh vegetable bibimbap, spring flower bibimbap, bud bibimbap, wheat bibimbap with spring wild greens and bean paste, plus a lot more. During the promotion, that runs from April 1 to 15, 2006, guests with a birthday in April are entitled to a 30 percent discount plus a discounted bottle of Majuang Mosel sold at only 28,000 won. Lunch is 27,200 won on weekdays and 36,000 won for dinner. Three private rooms are also available for any kind of meetings or gatherings.